Beaver Scouts are the youngest section of the movement and is open to 6-8 year olds who like having fun and making friends. We meet once a week as a "Colony" and, like all other sections, the Colony is run by trained, voluntary leaders and helpers. Many of these are parents of Beaver Scouts. Beaver Scout activities are a combination of learning and having fun. They learn about themselves and how to look after themselves and they get to know people from their local community. They find out about life in other countries and explore through organised activities. Their activities are based around making things, outdoor activities, playing games, going out on visits, investigating nature, listening to stories, learning how to be safe and most importantly, making new friends. 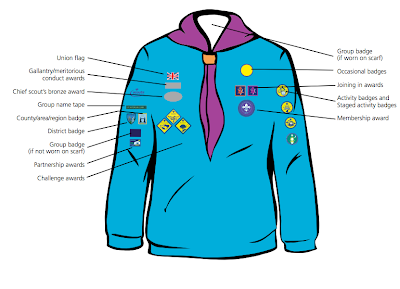 Scouting is a uniformed organisation and like all other sections Beavers wear a uniform that tells everyone they are a Beaver Scout. For instance, people can tell what Colony you belong to by looking at the colour of your scarf. Position of badges (click for larger image): The position of the Scotland badge badge can be found here.